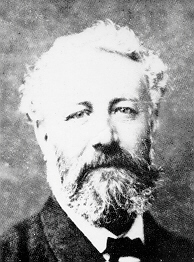 A nice, interactive Doodle is the contribution from Google to the 183th Birthday of Jules Verne. It's the right honor for the famous fantasy and science-fiction author. He was far ahead of his time, and some of the stories are already reality. In fact there is a big cult around him saying he was more than just an author. Whatever, he was brilliant and you can still read the stories as if they were written today in a unique and fantastic style. Just head over to the Google Homepage today to see it, and dive into the deep of the ocean where you can discover many strange things.